Common Walkingsticks (Family Diapheromeridae) are not rare here in southeastern Arizona, but I rarely see these stick-like insects because they are usually hidden away in dense, leafy foliage and so well camouflaged that they are almost impossible to spot unless they are moving. Late one November afternoon while I was photographing autumn leaves in the Rincon Mountains, I discovered this overly friendly Common Walkingstick below inexplicably crawling up my leg, so I picked it up and put it on a sprig of dead grass to photograph it. Common Walkingsticks feed on the leaves of the trees and the shrubs that they hide in, and these slow, slender insects are generally not numerous enough here to cause any real damage to plants. 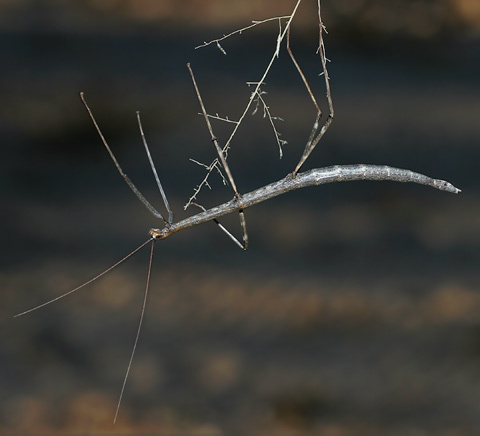 When seen up close, their mandibles may look a bit alarming, but Common Walkingsticks are not biters and not at all aggressive, although some kinds of Walkingsticks can produce a stinky fluid to repel potential predators. The scientific classification of our North American Common Walkingsticks has changed and differs greatly between online sources. 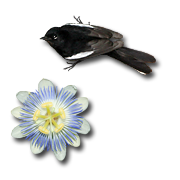 The Integrated Taxonomic Information System (ITIS) currently has them in Order: Phasmida and in Family: Diapheromeridae, so this is what I decided to use. 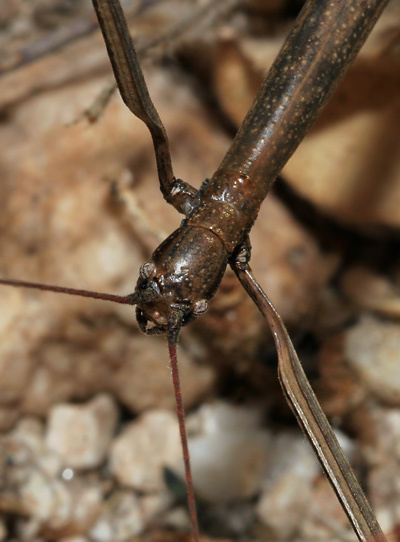 Other sources variably list our North American Common Walkingsticks in Order: Orthoptera (old), Phasmatoptera, or Phasmatodea and in Family: Phasmatidae or Heteronemiidae. What a confusing mess!